/ Incredible Things Can Happen When You Give up Sugar. Here’s How to Do It. Incredible Things Can Happen When You Give up Sugar. Here’s How to Do It. In part 1 of this series, How Sugar Keeps You Trapped in a Cycle of Addiction, we talked about the prevalence of sugar in the typical diet, how easy it is to inadvertently consume too much, and how addictive the tiny white crystals are. In part 2, What You Don’t Know About Sugar Can Kill You, we discussed how dangerous sugar is to health. Here, in part 3, we will explore ways to kick added sugar out of your life. You might be wondering WHY giving up added sugar is a good idea (unless you read part 1 and/or part 2 of this series), so here’s a brief overview. As you can see, you have a lot to gain and nothing to lose (except perhaps some extra body fat) by reducing or eliminating added sugars from your diet. But should you quit sugar cold turkey, or gradually phase it out of your life? A lot of people really struggle with it – “just one” cookie ends with the entire box disappearing. Having “just one” Coke results in two or three cans chugged by mid-afternoon. If you CAN do moderation, then work on gradually reducing your consumption of added sugars over time. After a few weeks, you’ll be surprised at how little you miss it. If you CAN NOT do moderation, cutting added sugars out completely is your best option, but you may experience some withdrawal symptoms and intense cravings for a week or so. Going cold turkey might be challenging at first, but rest assured – the cravings WILL eventually go away. Choosing to gradually reduce your intake can work too, but you might find it more difficult, as each bite of something sweet is likely to trigger a vicious cycle of cravings. Have a cookie or two after dinner and crave a donut the next morning, and so on. It will be difficult to break the cycle if you keep indulging. Important reminder: we are talking about reducing ADDED sugars. Many foods naturally contain sugar, and some of those are fine (examples: berries, apples, carrots). You don’t need sugar as much as you think you do. In fact, you can train your taste buds to enjoy things that aren’t as sweet. Try cutting out one sweet food from your diet each week. For example, pass on dessert after dinner or skip that mid-afternoon candy bar. 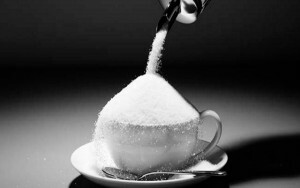 Start putting less sugar in your coffee or cereal. Over time, you will lose your need for that sugar taste. Eat more fruits and vegetables. You’ll notice their natural sweetness and they’ll taste better, too. Drink extra water. Try making flavored waters infused with fruit and herbs if you find it hard to drink plain water. If you drink soda, juice, or other sugary beverages (including those coffee shop mega caramel double mocha frappe latte drinks – they are LOADED with sugar), reduce your intake or cut them out of your diet completely. YES, juice comes from fruit, and YES, fruit contains nutrients, but juice lacks fiber and is much easier to over-consume than whole fruit. If you must have juice, save it for special occasions, dilute it with water, or have a very small serving. You can overdo it on fruit and starchy vegetables, too, so be mindful. Berries, avocado, cruciferous vegetables (like broccoli, cauliflower, kale, cabbage, and Brussels sprouts), leafy greens, mushrooms, tomatoes, radishes, cucumber, zucchini, green beans, carrots, and bell peppers are among the best low-sugar options. Try replacing sugary drinks with unsweetened tea. Flavored teas are available in a wide variety of flavors, including Blueberry Bundt Cuppa Cake, Caramel Vanilla Cuppa Cake, Red Velvet Cuppa Chocolate, Peppermint Cuppa Chocolate, Caramel Apple, and Coconut Cocoa. As long as you don’t add sweetener, these options are sugar-free. Get rid of any sugary temptations at home and at work. This includes any INGREDIENTS or mixes you may have in your pantry that can be used to make sweet treats like cookies, brownies, or cake. Consume enough protein, healthy fats, and fiber. They digest more slowly and don’t make your blood sugar spike the way refined carbohydrates and sugars do, and can help you stay full longer. If you are a fan of nut butters, get the ones that don’t contain added sugar, or make your own without sweetener. Avoid artificial sweeteners – some studies have shown they can increase cravings for sweets. Honey, brown sugar, and cane juice may sound healthful, but sugar is sugar. Honey and unrefined sugars are a tiny bit higher in nutrients, but they can still cause your blood sugar to rise. Read food labels, and choose items that don’t have a lot of sugar or better yet, are unsweetened. Whew! That’s a long list, but good information to have. Some products may contain more than one of those kinds of sugar, by the way. The best way to avoid added sugars is to prepare your own meals at home using fresh foods. Stick with chicken, turkey, meat, fish, eggs, fruits, vegetables, natural cheeses (not processed “cheese food”), unsweetened Greek yogurt, nuts, seeds, and healthful fats. When you find yourself craving sugary stuff, remember…you don’t need it. You are sweet enough already. The Nutritional Anarchy website is a participant in the Amazon Services LLC Associates Program, an affiliate advertising program designed to provide a means for sites to earn advertising fees by advertising and linking to Amazon.com. The site may offer health, fitness, nutritional, and other related information, but such information is designed for educational and informational purposes only. The information contained on the site does not and is not intended to convey medical advice and does not constitute the practice of medicine. You should not rely on this information as a substitute for, nor does it replace, professional medical advice, diagnosis, or treatment. Nutritional Anarchy is not responsible for any actions or inaction on a user’s part based on the information that is presented on the site.